First, navigate to Projects and there click on . You are directed to the Manage site, where you can edit the project’s details. You are automatically assigned as the project manager. While you are still in the project, click on Tasks in the ribbon and then into the New Task text box to give it a name. Click and the new task is created, displayed in the left column. Click on the task and drag it into another column, if you’d like to change the task’s status e.g. into In Progress. In order to assign existing tasks to an existing project, navigate back to the Workplace by either clicking on and then on Workplace, or by clicking the InLoox logo in the Top Bar. Now click on to open the Edit Task window and click on the tab Details. There you click on and select the project you want to assign the task to. 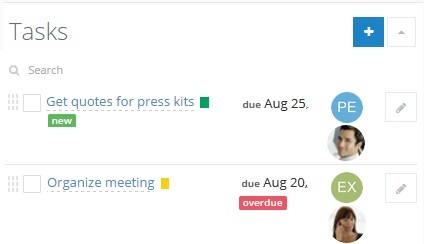 When you click on OK, the project’s picture, which is clickable and will get you directly to the project’s Manage site, is shown next to the task. EXAMPLE Here you see two tasks assigned to two different projects. Below the projects’ pictures, you see either your own profile picture, if it is a task created by you, or the profile picture of the person that assigned the task to you. Combine Tasks as a Project | InLoox 10 for Outlook • Copyright 1999-2019 © InLoox, Inc. All rights reserved.